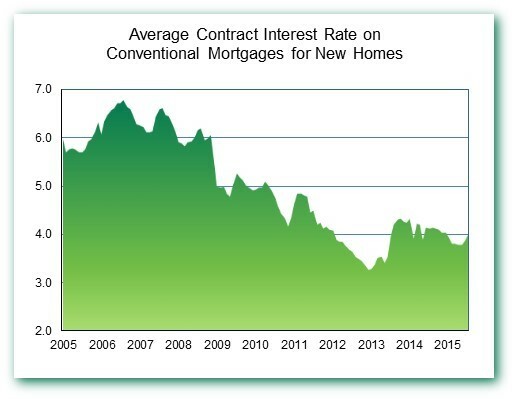 On average, the contract rate on conventional mortgages used to purchase newly-built homes increased 12 basis points in July, to 3.98 percent, according to data released yesterday by the Federal Housing Finance Agency (FHFA). At 3.98, this is the highest the contract rate has been since December of last year. Initial fees have some ability to offset increases in a loan’s contract interest rate. 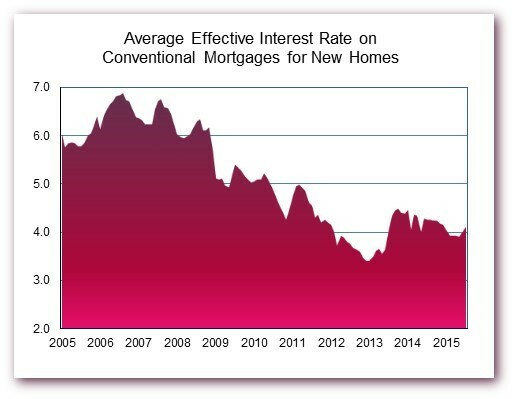 However, the average initial fees and charges on conventional mortgages used to purchase newly-built homes also increased in July, from 1.08 to 1.15 percent. As a result, the average effective rate on the new home loans (which amortizes initial fees over the estimated life of the loan) also increased in July, from 3.98 to 4.10 percent. This marks the first time the average effective rate on new home loans has been above 4 percent in 2015. Meanwhile, after rising to all-time highs the previous month, the average loan amount and price of new homes purchased with conventional loans both moderated in July. The average loan size declined by nearly $2,000 to $350,600 while the average new home price declined by nearly $4,000 to $458,000. Even after the declines, these are the second highest numbers on record. Because the home price declined by more than the loan amount in July, the average loan-to-price (LTP) ratio increased, from 78.3 to 78.8 percent. 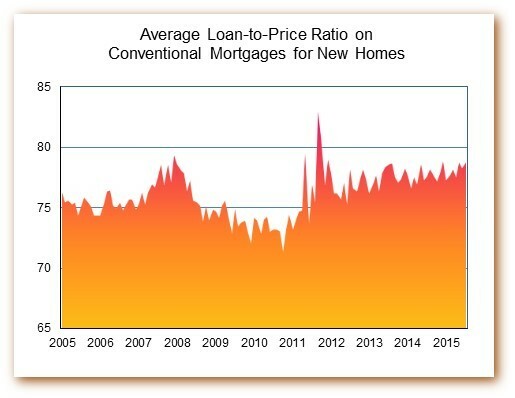 This is just about as high as the LTP ratio on conventional new home loans has been recently (the LTP has stayed below 79.0 percent every month since 2011). The above information is based on FHFA’s Monthly Interest Rate Survey (MIRS) of loans closed during the last five working days in December. For other details about the survey, see the technical note at the end of FHFA’s August 27 news release. ‹ GDP Growth in the Second Quarter – Upside Surprise, Implications for Fed Action?